Like other enabling technologies, ultrasonication has moved progressively from batch to flow conditions, which are more suitable for large-scale applications and industrial purposes. 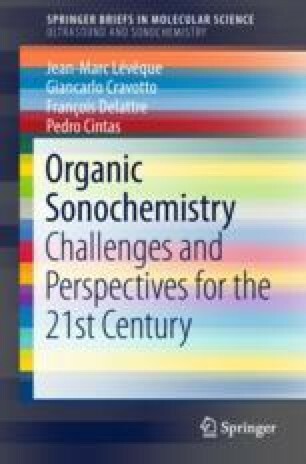 Without discussing comprehensively, the subject of sonochemistry underflow, this chapter provides some background and practical considerations with a focus on chemical synthesis in following the heading of this monograph. A deeper analysis is presented for miniaturized systems as microfluidics and machine-assisted approaches will doubtless be the future of chemistry. Ultrasound in microchannels helps to prevent clogging while enhancing considerably mass transfer. Moreover, such applications will require the design of more efficient micro-sonoreactors and an accurate control of external parameters. David Fernandez Rivas contributed to this chapter.